Image isn't everything, but in the world of business, attention to detail makes all the difference. Build up your recognition with Helloprint's full colour Printed Letterheads that'll keep your office prepared and coordinated. No need to to compromise quality for small prices when our quality range of letterheads can be customised to match your budget. Pair your business designs and info with one of four premium paper types and show your clients you tick all the right boxes, from the first look to the final detail. On 1 sideThe back will be left blank. On 2 sidesSubmit a design for each side. Full colour printing is almost always used when there are a lot of colours within a design. Pictures are for example a design with a lot of colours. Full colour exists of the following colours: Cyan, Magenta, Yellow, and Key (black). The colours are being mixed while printing, so almost any colour can be realized while using CMYK. Pantone colours are often used when a design only contains 1 to 4 colours. Pantone colours have a unique code within the Panton matching system (PMS), so that the result of colours used is always the same. PMS is mainly used for: Letterheads, envelopes, business cards and compliment cards. Wood-free offset paper stock is the most popular letterheads stock in the market. It is suitable for laser and inkjet printing machines and perfectly writable as well! This paper has a very white appearance, which makes it perfect for your corporate stationery. Wood-free Offset Letterheads stock is available in 80gsm, 90gsm, 100gsm and 120gsm paper. Conqueror paper is the best-known quality business printing paper on the market and often selected by our customers requiring a premium letterhead material because of its distinctive appearance. Available in 90gsm stock. Letterheads are made of writable, printable, unfolded paper. 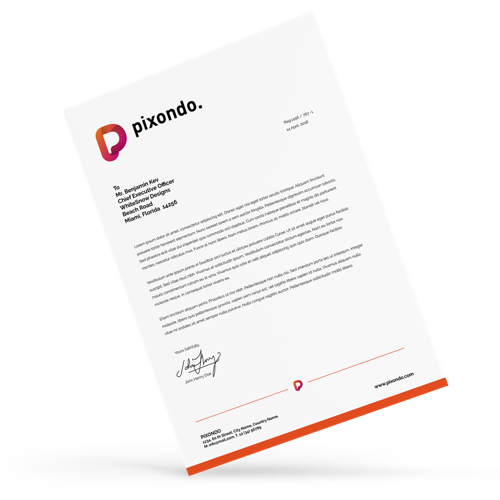 Letterheads are available in mutiple paper-types and thicknesses. This results in the option for you to choose the product that fits your likes and needs and which fits your companies' identity. You can print your own logo and design on the letterheads to give them a professional and outstanding look! For the delivery of your letterheads design we use multiple carriers. Because of the highest reliability, in most cases we use UPS or DPD. The letterheads design that is chosen in most cases can be selected via our website.